Grade Potential has excellent tutors who are passionate about working with young students. Through personalized, in-home elementary tutoring, we give your child the foundation for a lifetime of self-confidence and success. 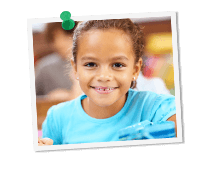 Each elementary school tutor at Grade Potential knows how to cater to your child’s specific personality and learning style. From your first phone call to our office, we strive to better understand your child so that we can most effectively work towards achieving his or her goals. We provide individualized, one-on-one tutoring from the comfort of your own home in order to make learning as convenient and helpful as possible. Developing minds need proper support—through an elementary school math tutor, an English tutor, a history tutor, etc. Unless otherwise requested, we exclusively use credentialed teachers with our elementary school students. As with all of our tutors, we take great care to make sure the elementary school tutor you receive will be a right fit for your family, both in terms of personality and rapport.